From what I can tell, Biscuits flies somewhat under the local dining radar, tucked away as it is at the end of the Broad Ripple Station strip mall behind the much larger, much flashier Thr3e Wise Men. After an inaugural breakfast visit with the hubby, I’ve come to the conclusion that we’ve been overlooking this little gem for way too long. 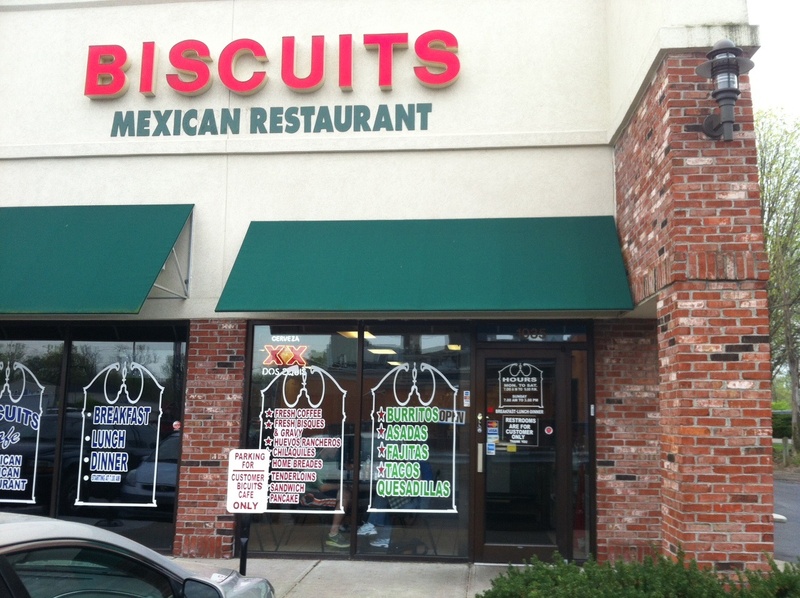 The name is something of a misnomer; you wouldn’t expect an authentic Mexican eatery to disguise itself under a name like “Biscuits.” At least, I wouldn’t. Don’t be fooled. 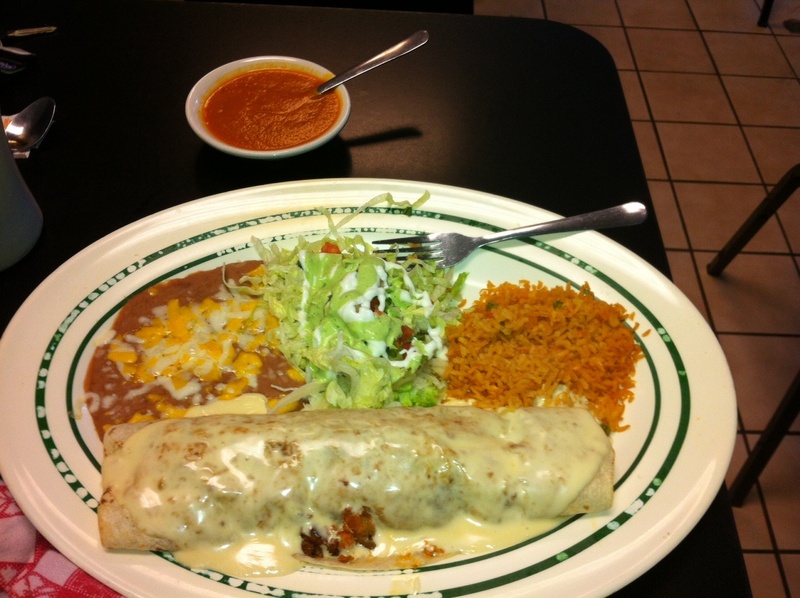 This is some yummy, rustic south-of-the-border food. The décor isn’t anything fancy, just blue booths and tables and a couple televisions. Wasn’t very busy mid-morning on a Wednesday, but the customers we did see were a pleasantly diverse group — business folks, Broad Ripple youngsters, an older couple. The gang’s all here. I was a little intimidated when I got a peek at the size of the plates. Normally, I’m not a big breakfast eater. A bowl of cereal or a muffin and some coffee usually does me just fine for the a.m. These breakfasts are not messing around. This is a seriously gut-busting amount of food for a morning meal. Choices include a range of standard short-order fare along the lines of eggs, bacon, toast, B&G (natch) and the like, but I figure you can get that stuff anywhere. 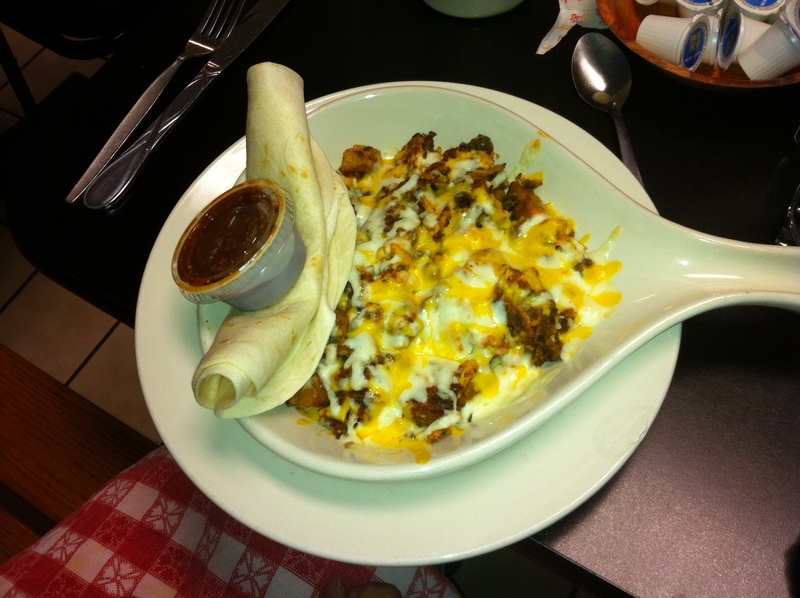 Instead, we set our sights on the Mexican offerings – huevos rancheros, quesadillas, chilaquiles, and such. Hubby ordered a breakfast burrito and I opted for the chorizo scramble. The food was cooked fresh at the grill, and arrived on piping-hot plates. Hubby’s burrito was stuffed with sausage, eggs, cheese and potatoes, served with refried beans (not sure how smart this is first thing in the morning), rice and some shredded lettuce. Not an onion in sight, thank God. He also got a small dish of what I thought was salsa, but was actually more like a spicy blended sauce accompaniment served hot. Likewise, my chorizo scramble was darn tasty — a skillet of eggs scrambled with copious amounts of chorizo sausage, potatoes and tons of cheese. I also got a couple of warm very fresh tortillas, a welcome alternative to boring old buttered toast. For garnish, I received a little plastic cup of some sort of chili sauce, but it had obviously come straight from the fridge and concealed into a strange Jell-o consistency. I skipped it and went for a few splashes of Cholula instead. Our server wasn’t terribly chipper, and the coffee was your basic drip variety served with those terrifying little non-dairy creamers that don’t require refrigeration (my biggest pet peeve when dining out for breakfast), but all in all, Biscuits is a great discovery I was happy to make. Our total bill was $19 for two pre-tip. Not exactly cheap, but certainly a fair price for this amount of food. Adios for now, amigos. We’ll be back.